If you are on a hunt for a fruit themed online slot you have come to the right place. 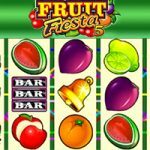 We present the Fruit Fiesta 5 Reel video slot game from Microgaming. Not only does this game offer the traditional classic look but it also includes some new and improved features. If we say that progressive jackpot is one of them, you probably do not want to hear about anything else, and think to yourself this is enough for me. We have a scatter symbol in this game which looks like a fruit salad and it offers only scatter payout for 3, 4 or 5 symbols anywhere on the reels. The scatter does not activate any features in this game but we do not mind. The wild has the main role in Fruit Fiesta 5 Reel. Its primary function is to substitute for all the other symbols, except for the scatter to complete a winning line. Its main function is to bring the progressive jackpot to your bankroll. You need to land 5 wilds on the 15th pay line and you will win the constantly changing sum above the reels. Seeing those numbers transfer to your balance is once in a lifetime experience. 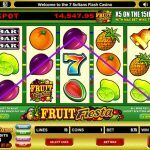 Fruit Fiesta 5 Reel is a remarkable game and Microgaming is one proud owner. The game takes us back when times were simpler and games were played in pubs and bars. Let’s face it not everyone has a chance to go to Las Vegas or Monte Carlo. A simple traditional game that has lots to offer regarding the game play and experience but also the big prize is another huge plus too. If you have a chance, then you should try this game for sure. 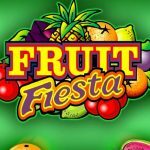 If you want to try the previous version of this game you should consider playing Fruit Fiesta 3 Reel a 3 reel slot by MicroGaming.